Frankly, this is first and foremost a shop-window alert to see if anyone else wants to come along to the remaining two talks I'm giving on Proms-related works: on Janáček's The Makropoulos Case tomorrow (10 August) 2.30-4.30pm at an address in Lancaster Gate, and on Mahler's Seventh Symphony, Thursday 18, same time, in St John's Wood. Addresses supplied on enquiry to me at david.nice@usa.net. 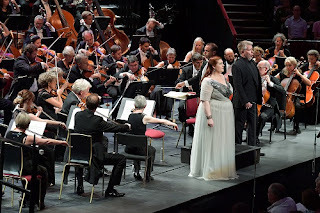 Tamara Wilson is also due to return to the Frontline some time in the week of 5 September before her guaranteed-amazing performance in the Verdi Requiem on 9 September. She'll get back to me once she knows her rehearsal schedule. And you'd better believe that Tamara is almost as good a talker as she is a singer (only 'almost' because the singing is something superhuman...). There she is below with Mark Wigglesworth and James Creswell in the closing scene of Act Three from Wagner's Die Walküre. Back in July we covered Mahler 3 and Berlioz's Roméo et Juliette, and I learned a lot more simply retracing familiar territory - there's no end to what you can keep on finding in the great masterpieces. Nor did the performances disappoint - though I felt a little distanced from Haitink's magisterial and at times very slow Mahler and JEG's Roméo would have been perfect if he'd had a Friar Laurence as good and true-bass-y as David Soar for Andrew Davis earlier in the year. Highlights of the ones I've caught so far? Unquestionably Mark Wigglesworth's converting me almost completely to Tippett's A Child of Our Time, with fabulous soloists alongside Tamara and an apotheosis that really was levitational, and 27-year-old Pavel Kolesnikov as soloist in Tchaikovsky's glorious Second Piano Concerto alongside the superlative National Youth Orchestra of Scotland under Ilan Volkov (who quite transformed the imperial style into something altogether more humanly joyous). HK Gruber was a star yesterday lunchtime, too. The NYO experience the previous evening was a little tainted by Ed Gardner's dim view of Strauss's Also sprach Zarathustra - no idea what he wanted to say, if anything, with the work - and by my neighbour, who sketched throughout. This, inevitably, I didn't mention in the review, but he started by thinking he was some kind of artistic seismograph attached to Iris ter Schiphorst's Gravitational Waves, pencilling squiggles and zig zags as the music took him. You can imagine the resulting chaos on paper. For Strauss and Holst, he contented himself by drawing the players and clearly thinking this would be the main event of the evening for his neighbours, whom he immediately started showing the results. Halfway through The Planets, I thought that instead of getting into an altercation with him if I asked him to stop, I'd unostentatiously put my rucksack on my knee so I couldn't see his drawing, but this of course impeded his wide-ranging right hand so he got indignant. Then he and his ferocious wife changed seats. I knew she'd be spoiling for a fight at the end, and determined to avoid one, but she got it by sitting and refusing to move as we and a nice, baffled gentleman behind us wanted to get out. 'You are the rudest audience I've ever encountered!' she blustered - having fidgeted throughout and hummed along out of tune to Holst's 'Jupiter' tune aka 'I vow to thee my country' - whereupon I cried shame on her. Oh dear - these conflicts are not to be stoked, but what can one do? Otherwise, the Proms audiences haven't been bad at all, and it was redeemed the next afternoon by my being able to tell the little girls sitting in front the story of The Firebird before it began. Which meant they enjoyed it enormously, if a little actively, playing princesses and ogres, which I didn't mind at all. Fondest peripheral memory so far: seeing the huge queue stretching around the block ten minutes before Haitink's Mahler 3 was due to start. Even though it may have been mixed up with another waiting for the late-night Bowie Prom (which I switched on the telly back home to watch live, and off when the rapper came on), it reminded me that nothing has changed since I joined the queue for his 'Resurrection' in 1978. As I recount in the Arts Desk review, it was my first Promming season and I arrived too late to be admitted into the Arena; my one and only Gallery experience taught me never to go up there again. Still, it was the summer of Discovering Mahler and Abbado's Chicago recording was the first symphony recordingr I borrowed from Banstead Library. Thrilled, too, to take dear friend Chris Gunness's 18-year-old nephew Andrew Lavelle to Proms while he was visiting from Houston. His first experience of the Albert Hall - that was good to get - and as he has a very wise head on young shoulders his responses were all perceptive. He soon takes up a place as a very talented viola-player at the Juilliard: what discoveries lie ahead for him. There he is above with uncles and friend. And this is the Albert Memorial at c.9.30pm. Darkness on emerging from a Prom is a sure sign that the days are getting shorter again - September visits are always tinged with a certain circumstantial melancholy. The nearby Serpentine Pavilion is a triumph this year, one of the best, from Danish architect Bjarke Ingels. That will last us well into early Autumn. And I have still to seek out the smaller projects around Kensington Gardens, though I'm told they're not up to scratch. Proms photos by Chris Christodoulou except lead image of NYO, by Mark Allan. All courtesy of BBC. Actually, Elizabeth, it was reasonably funny at the time - the new piece was not compelling, and Gardner's interpretation of Also sprach Zarathustra uninteresting in the extreme. I did want to focus on the very good performance of The Planets, though, which is where I thought the rucksack would come in useful. I know now that I have to exercise restraint with such people, or I could be sued for the laying on of hands. Anyway, they got red-faced with anger and I merely shouted 'shame on you' as I exited, but not in fury. "there's no end to what you can keep on finding in the great masterpieces." Isn't it the truth, and indeed, perhaps the measure of what makes a masterpiece. I very much look forward to the coming season, and of course your Prom report brings back fond memories of my one and only time attending (so far) in your company. The photo of the Albert Memorial at night bears strong resemblance to its look, with the storm clouds gathering, that night. Great example, and to think it was the second cello that saved it. It was the "external" cello which David reports as saving the performance. Strictly, just 'second cello', though if a quartet takes it on then it needs an 'external' cello. Each of the works of 1828 places Schubert 'in the very top rank': the three amazing final piano sonatas, the 'Death and the Maiden' Quartet and the Schwanengesang, which I heard Goerne perform so shatteringly with Andsnes in Rosendal. David D: I do wonder sometimes, what gives rise to your need to "correct" what is unnecessary to correct. Absolutely, Sue (but I know the occasionally pedantic Sir David well, otherwise I'd sometimes take offence). As I stressed, 'external' was the word that needed correcting - it wouldn't please Schubert. The String Quintet is all of a piece - or it should be, and wasn't on this occasion. Anyway, I hope my two most diligent commenters won't come to blows.